The first product manufactured mostly from the resources that company C.I.A.K. Ltd. delivers to battery manufacturers from its own production processes at the modern Recycling Centre where lead is produced, and from the plastic raw material that the company C.I.A.K. Ltd. is also recycling and processing and then returning to the production process of battery cases. 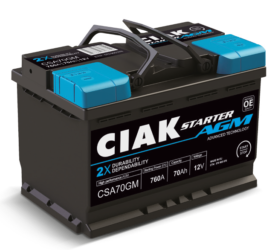 CIAK STARTER AGM START-STOP is manufactured with the latest technology in battery manufacturing under the name AGM (Absorbed Glass Matt). That way, the maximum performance of the battery is achieved, as well as the constant grid use in its absolute capacity and use of its surface on all parts with same consumption levels, without the possibility of sulfation or electrolyte delamination. Battery that is the quality leader of the class of standard batteries with the maintenance free technology. It is the battery that, with the same technological performances, can be found in every manufactured car in the world. With the wide array of different models, this battery covers the needs of 99% of all manufactured cars and it can, with its technology, satisfy even the most demanding conditions of use. 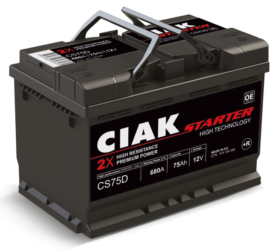 Because of the combination of high durability and extremely reliable working performance, as well as MF technology (Maintenance Free), CIAK STARTER battery significantly reduces the costs by giving the user the ideal value for money. As the result of the market globalisation across the world in the last twenty years, beside traditional European car brands on our market, vehicles coming from Asian continent make up more and more cars on the vehicle fleet. CIAK STARTER ASIA models are technologically and dimensionally particularly manufactured and adapted for vehicles that demand such battery type. 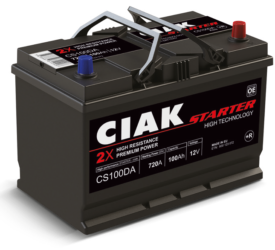 With the range from 35 Ah to 100 Ah and with adapted features and technological demands coming from car manufacturers, CIAK STARTER is once again placed on the top of the world offer, even in this ASIA class.